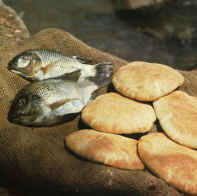 Classically Liberal: Obama's loaves and fishes: fraud or miracles? Obama's loaves and fishes: fraud or miracles? The Obama Adminstration is perpetrating an intentional fraud on the public. They are lying. Obama is pretending that his stimulus package is creating jobs—it can't create jobs. At best it can only redistribute them from productive sectors of the economy to unproductive sectors. At worst, it redistributes fewer jobs than it destroys. It is hard to measure all the jobs destroyed by the stimulus package but it is easy to show that the administration has created a system that makes up figures to support a bad policy. Associated Press reported that, according to official statistic, stimulus saved 935 jobs at the Southwest Georgia Action Coucil "an impressive success story for the stimulus plan. Trouble is, only 508 people work there." Associate Press reports that when they looked at "saved" jobs they found that the Feds were counting pay increases for bureaucrats as "saving" a job. So, a worthless, destructive, economic parasite is giving a pay rise and Obama pretends that "saved" a job. Actually the economy would benefit if those people were given pay cuts—or better yet, fired. The Bergen County Community action Program got $213,000, almost all of which went to increase the pay of their employees. This was added into the Obama figures as 85 jobs saved. Her conclusion is so far off that it illustrates bureuacratic innumeracy. No one this mathmatically inept should be running any agency, at any level. The Council in question says that this was simply bad math and that "there was no effort made to deceive anyone." The correct figure should have been 9.35. Their math was only off 100 fold. Even, the correct math is deceptive as no jobs were saved, exisiting bureaucrats just got a pay increase and that is not hte same thing. The New York Times reports that the Fayetteville National Cemetery, in Arkansas, spent $1047 in stimulus money to buy a lawn mower to cut grass. That one lawn mower is credited by the Feds with saving or creating 50 jobs. In comparison they report that Chyrsler, which received $52.9 million in stimulus bailout funds "claimed the money did not save a single job." Which is probably the case. Even the Obama officials claim that half of all the jobs "created" or "saved" by the stimulus money was in the field of public education. "But some school districts said that they might not have actually laid off teachers without stimulus money." The Times reports that while Obama pretended that 90% of the "jobs" that stimulus was said to create, would be in the private sector, that the officials statistics shows that "well over half of the jobs claimed so far have been in the public sector." And even the private jobs attributed to the stimulus boondoggle are clearly fake. "In one, a Kentucky shoe store reported that it had created nine jobs with an $890 order for work boots. In another, a $7960 contract for a 'Basketball System Replacement" in Ohio claimed three jobs." Head Start in Wisconsin used the money they were given to increase the salary of their staff by 1.8%. This pay increase was listed as saving 113 jobs. The total they spent per "job created" was supposedly $160. A spokesman for the agency said: "We think the 113 jobs were preserved, but more importantly, the quality of teachers and Head Start child development staff was maintained." So pay rises given to the same people maintains their quality? Even if that is granted it there is no evidence it preserved a single job. The other thing is that this section of Head Start only deals with migrant workers. I know the Obamatrons think he's the new messiah. So is this the Obama version of the alleged loaves and fishes miracle of Jesus? Obama takes $160 and gives it to a bureaucrate and magically creates an entire new job from it. Exactly how many employees are there dealing with this relatively small number of workers? My research indicates there are about 6000 migrant workers in Wisconsin during any one year. So apparently, just this one division of one relatively small federal agency claims that it needs at least one employee per 53 people that it "helps." Even that is generous. According to this report there are about 5000 migrant workers in Wisconsin with about 1000 dependents. Head Start is " a national program that promotes school readiness by enhancing the social and cognitive development of children through the provision of educational, health, nutritional, social and other services to enrolled children and families." This one section of Head Start has 113 employees allegedly helping the children of migrant workers. All the migrant workers in Wisconsin bring a total of 1000 dependents with them. And not all these dependents would be children in the age group that Head Start supposedly helps. At best this is one buureaucrat at Head Start per 10 individuals being helped. The Milwaukee Journal Sentinel reports that $7.3 million for a sanitary district projet is listed as creating or saving 100 jobs "even though the work won't start until this spring.... But that number is inflated by 95 jobs, Parkland Sanitary District treasurer Eric Shaffer admitted." Actually a series of errors took place there. The report was supposed to say 5. It got typed in as 50. And then the 50 jobs were counted twice. Even the 5 jobs are dubious. If government takes a million dollars from the private sector jobs are contracted there as a result. To then redistribute that money to the state sector doesn't create "new" jobs. It just moves private, productive employment to unproductive, government employment. However, the Feds never count the jobs they destroy in their calculations. They pretend that the stimulus money didn't cost any jobs anywhere. My view on this is not new. I've been saying for years that federal redistribution doesn't create new jobs. Instead, I have argued that at its best it redistributes them. But rarely do such projects work at their best. So the net result, I've argued, is to destroy jobs, not create jobs. And while Obama pretends his wasteful spending has saved or created some 600,000 jobs the most recent unemployment figures show that in October alone construction fire 62,000 workers, another 61,000 disappeared in manufacturing, retail lost 40,000 jobs and another 37,000 were destroyed in the leisure industry. Unemployment was at 6.6% when Obama took office. After one year of his stimulus, job-creating programs, unemployment now stands at 10.2%. Of course, we also had a year worth of stimulation from George Bush prior to that. And, coincidentally perhaps, we have had 22 months of consecutive job losses in the United States. If you want to understand the fraud of government "job creation" projects read Frederick Bastiat expose of the policy in his 160-year-old essay, "What is Seen and What is Not Seen." posted by blog owner at 11/06/2009 07:03:00 PM DiggIt! Reddit Del.icio.us Slashdot It! Wishful thinking at its best. How conservatives undermine economic freedom. Honor killing in Arizona & Let the baby die. At least they can be entertaining. Finally, the real motivation comes out.